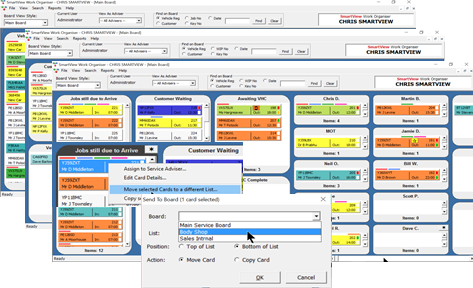 SmartView has an easy to use Drag & Drop interface to manage the T-Cards on the board. The T-Cards in SmartView represent a single job, task, project or repair. Up to six different boards can be set up for departments, projects or area's. T cards can be moved easily between boards. Lists on a SmartView T-Card board can be created and configured how you like. Lists can be set at different heights to make best use of the available screen size. Lists will be placed below each other if there is room, before being placed side by side. If the SmartView board is bigger than the screen, the system will allow you to scroll the board left and right to view Lists which may be off the screen. As T-Cards are moved around the board, a window can pop up to ask for additional details such as duration of the job. When T-Cards are moved to a Completed list, they can be archived into the history where you can perform database searches when required. A large array of details can be stored against each T-card, all captions, titles, descriptions are editable, custom indicators can be set on each t-card together with a symbol icon. There is plenty of room for comments, all comments are timed and dated with the ability to notify the person responsible for the job/task or project as soon as a comment is written. Visual Warning Indicators are automatically activated on a T-Card board when the Job is close to its due out time, or when a tasks allocated time has overrun. SmartView records all activity on the board into a log file which all users can see. Examples of activity include T-Card Movements, Comments on T-Cards, Alert/Alarm Snoozing etc. This log can also be printed. Network Ready / Multi User system - Locally hosted on your own servers and network workstations.